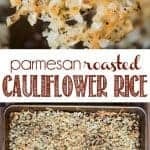 Parmesan Roasted Cauliflower Rice is one of those quick and easy veggie side dishes. It goes with everything from a low carb chicken and Brussels Sprouts meal to a mouthwatering bacon wrapped meatloaf. It really takes no time to put together, especially if you buy the cauliflower rice pre-packaged, which is exactly what I do (I buy an organic bag of cauliflower rice at Costco). 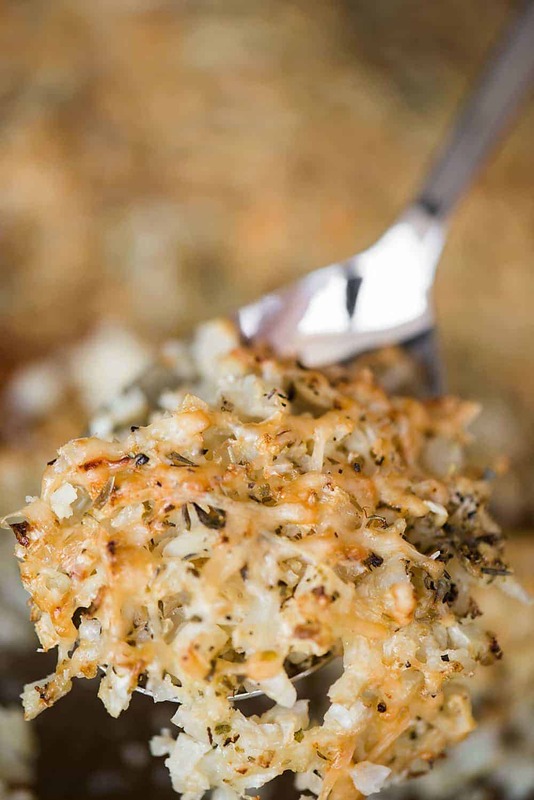 In just minutes, you have the easiest roasted cauliflower side dish, and its made extra tasty with golden brown parmesan and herbs mixed in. 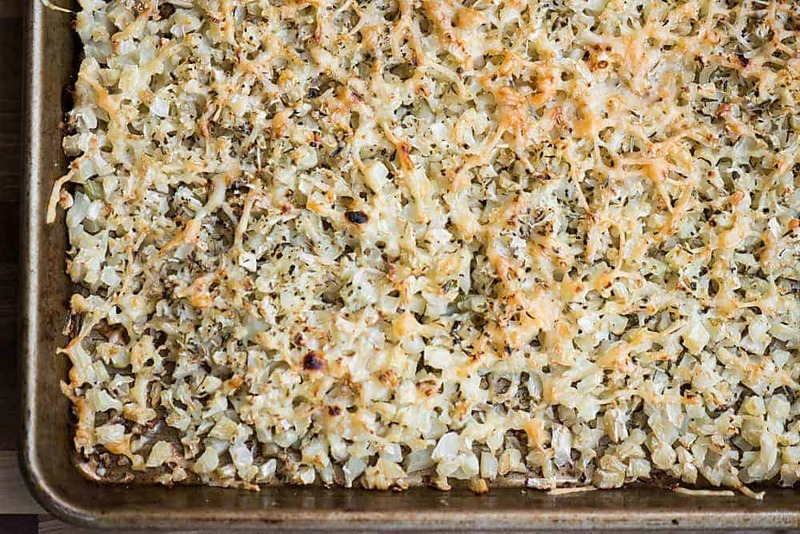 Here’s the bonus – roasted cauliflower doesn’t just taste good, and cauliflower rice isn’t just super easy, but its so good for you! Cauliflower is a member of the cancer-fighting cruciferous family of vegetables. Cauliflower contains sulforaphane, a sulfur compound that has also been shown to kill cancer stem cells, thereby slowing tumor growth. Cauliflower is anti-inflammatory and antioxidant-rich, and may boost both your heart and brain health. Cauliflower contains a wealth of anti-inflammatory nutrients to help keep inflammation in check, including indole-3-carbinol or I3C, an anti-inflammatory compound that may operate at the genetic level to help prevent the inflammatory responses at its foundational level. There are two ways I can think of to tell you how to make cauliflower rice: either you buy a head of cauliflower at the grocery store or the farmers market and you pulse it in the food processor until it is finely chopped, or you buy cauliflower rice ready to use at the store. You could always chop the cauliflower rice by hand, I suppose, but this recipe is all about it being quick and easy. I have found that buying pre-packaged cauliflower rice is your best choice when planning on making roasted cauliflower because it comes pre-washed and there’s no excess moisture in the bag. Are there carbs in cauliflower? The answer is yes. There are about 29 grams of carbs in one medium head of cauliflower. 1 cup of raw or cooked cauliflower has about 5 grams of carbohydrates. Cauliflower is rich in fiber, which is a type of carbohydrate. Of the 5 grams of carbs present in 1 cup of cauliflower, 2 of those grams of carbs are from fiber. 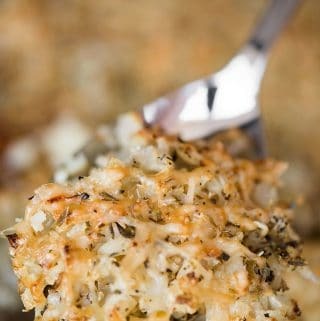 If you’re eating a paleo or keto diet, cauliflower is a great choice and can make an easy substitute for potatoes or bread, depending on how you plan on using them. Baking Sheet: I’ve been using this one for years. I love that it’s made in the USA, the sides are high enough to keep anything from spilling over, and it’s warp resistant. That’s basically the only thing I used to make this roasted cauliflower. Easy, right? 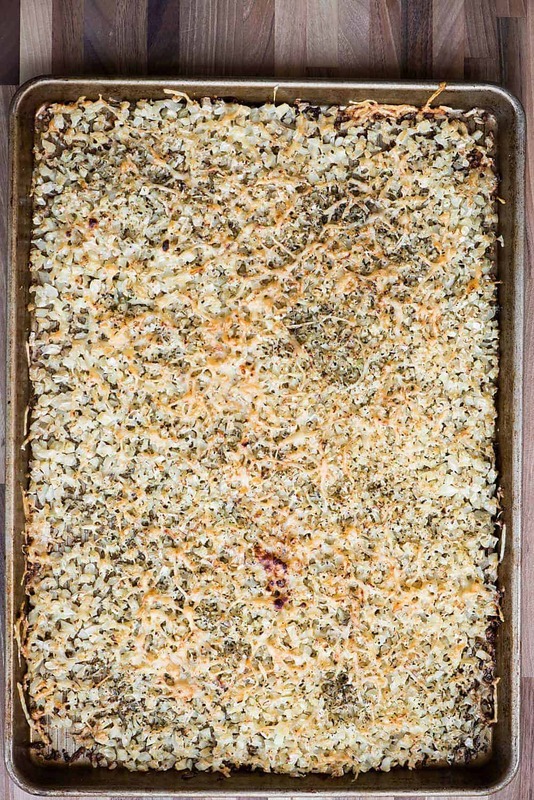 On large baking sheet, combine all ingredients except about 1/2 cup of the shredded parmesan. Mix to evenly distribute the oil, cheese, and herbs over the cauliflower. Spread in an even layer. Top with remaining 1/2 cup parmesan cheese. Bake in preheated oven until golden brown, about 30min. No need to stir during cooking. Serve warm. I made this with the “confetti” vegetable rice from Whole Foods and it was amazing! Can’t wait to make it again. So simple, so flavorful. I haven’t seen that! I’ll have to pick up a bag next time I’m there. Thanks!!! If your store is similar, it is in the in-house packaged produce refrigerator. I have no idea what morsels of happiness were in there, but I have shared this recipe with everyone I know because it was so delicious and so easy! LOVE this! The only way I can eat cauliflower “rice”. is it one teaspoon of each of the dried herbs? so, like 3 teaspoons total? Hi Summer, One teaspoon total. I’ll update the recipe to make it more clear. Thanks! I have have the frozen pre-packed cauliflower rice. Should it be thawed before going in the oven or frozen. Hi Veronica, Sorry for the late reply! I would thaw before cooking, otherwise the parmesan would brown too much. Would love to know nutritional info. Hi Karen, I added it to the recipe. Thanks! Looks yummy! Just wondering, how large is a serving? the cauliflower cooks down a bit, so the serving size is about 1/2 cup. Perfect as a side at dinner. Hi Maryann, I would thaw the frozen cauliflower first and I would just jump all three bags in. A little more cauliflower than what I call for will still taste good! What would you accompany with the cauliflower rice? Hi Keryn, I like to serve it as a side dish. Goes great with a nice piece of grilled fish, but works with anything really. Enjoy! This recipe is awesome! I had some leftover cauliflower rice and I added bean sprouts and water chestnuts because I had that leftover too. I used grated Romano cheese instead of Parmesan because I prefer the taste. Also, I squeezed out any remaining moisture in the cauliflower before I mixed it with the other ingredients. The seasonings I used was black pepper, garlic powder, and onion powder. Loved this recipe! Definitely will make this again!